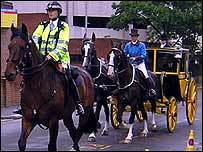 News of Nelson's victory at Trafalgar has come again to Hounslow in west London, nearly 200 years after the bearer changed horses in the town. Lt John Lapenotiere reached Hounslow near midnight on 5 November, 1805, to begin the last leg of his journey. On Tuesday actor Alex Price, dressed as Lapenotiere, rode into Hounslow in a fast carriage like the one he used. It comes near the end of a series of events marking the route the dispatch took from Falmouth to Whitehall. Shoppers gathered at Trinity Church to watch Alex Price hand Hounslow's mayor Darshan Grewal a copy of the New Trafalgar Dispatch created to mark the re-enactment. They cheered the "news" of the victory, booed at the mention of Napoleon - and fell silent at the remembrance that Nelson himself died in the midst of his greatest victory. Lt Lapenotiere took his dispatch from Falmouth to Whitehall in 37 hours, arriving at the Admiralty at 1am on 6 November. He made 21 stops to change horses, each of which will be marked by a plaque. Hounslow's vicar, the Rev Oliver Ross, reminded the crowd that the defeat of Napoleon's navy at Trafalgar was "as important and powerful as D-Day," when Hitler's plans to dominate Europe, like Napoleon's before, were scattered. He added: "Maybe we need to build again that sense of brotherhood" like that which famously existed between Nelson and his captains. The New Trafalgar Dispatch honours the memory of Nelson; all the heroes of Trafalgar (including the defeated French and Spanish) and the "brotherhood of the sea". 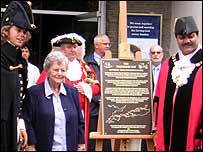 Afterwards a plaque, recording the dispatch's last stop - a rushed change of horses at a cost of £1-14s-6d - was unveiled by the Mayor, assisted by Roma Richards of Cornwall, the great-great-great-great-niece of Lt John Lapenotiere. Mayor Grewal said it was a "great occasion" for the town - "We should all be proud of that." In 1805 there were 200 inns in Hounslow, for centuries a coaching town. Nothing of the High Street Lapenotiere saw remains. It is not certain which one he used. But as the post-chaise set off along the High Street between Nationwide and Ann Summers on its way to a civic reception, vicar Oliver Ross commented: "We can't let such a bit of history slip through our fingers."